Little Round Top offers a stunning view of a picturesque portion of Gettysburg National Military Park. It’s also the site of the General Warren monument, a favorite among many. Take a selfie with these breathtaking views in the background for a still capture of your Gettysburg memories or grab a shot of the scenic landscape below. If you just can’t get enough of President Lincoln, journey to Gettysburg National Military Park Museum & Visitor Center for a photo with him. You can join President Lincoln on the bench, or take a selfie with him. He’s very photogenic! We all deserve to feel gorgeous. Let your glamorous side shine and take a picture feeling fabulous on the “Hello Gorgeous” bench right outside of Fresh Boutique in Downtown Gettysburg! You’ll also want to venture inside the store for some trendy clothes and accessories. The Cupola at the Seminary Ridge Museum has to be one of the best views in town! You can see for miles around, and have the opportunity to get the same vantage point Brigadier General John Buford and his staff had on the morning of July 1, 1863, as the Battle of Gettysburg began. Don’t forget to grab that perfect shot before you descend! The Historic Round Barn and Farm Market in nearby Orrtanna, Pennsylvania is one of the only standing round barns that remains today. Capture a photo of this historic barn and its countryside backdrop and you’ll be sure to get a ton of likes on Instagram. The statue with President Abe Lincoln and a modern-day civilian at Lincoln Square is arguably one of the most iconic locations in Gettysburg. This statue stands outside of the David Wills House, where Lincoln finished the famous Gettysburg Address. It’s a must to strike a pose with Abe and his friend before leaving town! Gettysburg Goat Yoga is a new experience in Gettysburg and quickly gained popularity. Ticket sales sky rocketed as word got out! Relax your mind and body, and cuddle up with some adorable goats, for an authentic Adams County experience on a Gettysburg farm. The cute pictures you capture here are sure to crack a smile on social media. Adams County is known for its produce – primarily its apples but also its blueberries, cherries, strawberries, apples and more! You’ll have a fantastic time picking your own fresh juicy produce at one of our farms and there are plenty of opportunities for photo captures of the experience. This monument was erected in Gettysburg National Military Park in remembrance of those Pennsylvania soldiers who valiantly fought in the Battle of Gettysburg. The memorial itself makes an impressive photo, but don’t forget to capture a panoramic shot from the top as well! The monument offers a beautiful view of the battlefield. Lincoln Square in the heart of downtown Gettysburg is one of the most iconic spots of the town. Grab a photo here next time you visit as a memento of your trip. Hint: The Christmas Tree erected in Lincoln Square for the holidays is a beautiful sight to see! 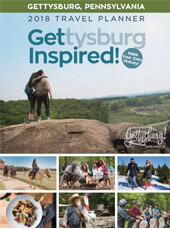 These are just a few spots to get that perfect shot in Gettysburg – but there are so many more! Let us know in the comment section what your favorite “Instagrammable spots” are! Don’t forget to share your Gettysburg photos with us on Instagram with the hashtag #GettysburgInspired to enter our photo contest and have the chance to win awesome prizes!